First I want to tell you all that I am having a hard time writing this post because I can’t stop looking out the window. It started snowing outside! I better get used to it, otherwise I’ll have a very unproductive season. Some argue that the formula for happiness is reality over expectations(H=R/E). I am going to contest that. I think that the best formula for happiness is crispy topping over soft baked apples (see below for an image of the formula). I am talking about good ol’ fashion apple crisp. 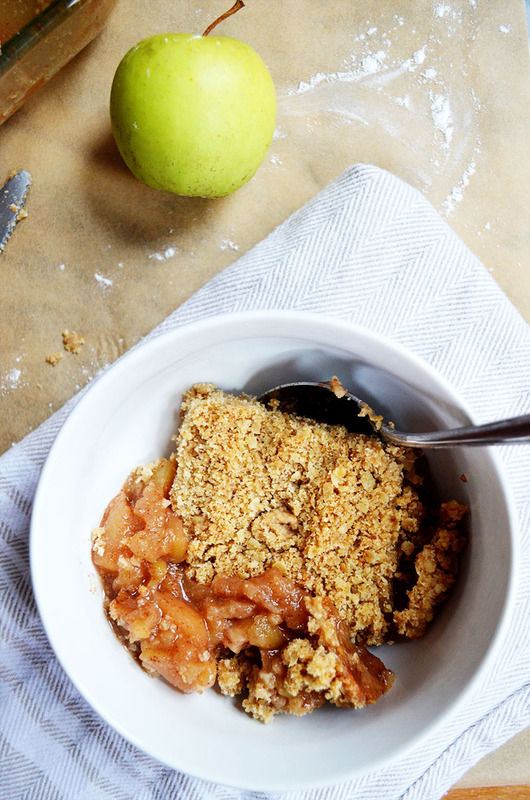 There’s no denying that the soft apples and the crispy topping are soulmates. This recipe couldn’t get any easier. I think the hardest step is waiting for it to finish baking in the oven. I plan on having this for breakfast all week long. Perhaps, in the evenings too, with a scoop of vanilla ice cream! If you are looking for a delicious and simple fall dessert for your Thanksgiving menu, you should definitely make this apple crisp. I’ll use any excuse to make this again. Preheat the oven to 350 F degrees and grease a 9x13" baking dish. In a large bowl, combine the apples, granulated sugar, dark brown sugar, ground cinnamon, and ground nutmeg. Pour into the baking dish, then set aside. In a separate large mixing bowl, combine the flour, granulated sugar, dark brown sugar, salt, oatmeal, and butter. With an electric mixer, mix on medium-low speed for 5 minutes, until the butter forms pea size lumps. Spread the topping mixture over the apples. Bake for 1 hour, then serve warm with ice cream. This entry was posted in Breakfast, Desserts & Sweets. Connie, that last photo is so beautiful, it makes me want to reach into my screen so I can take a bite! 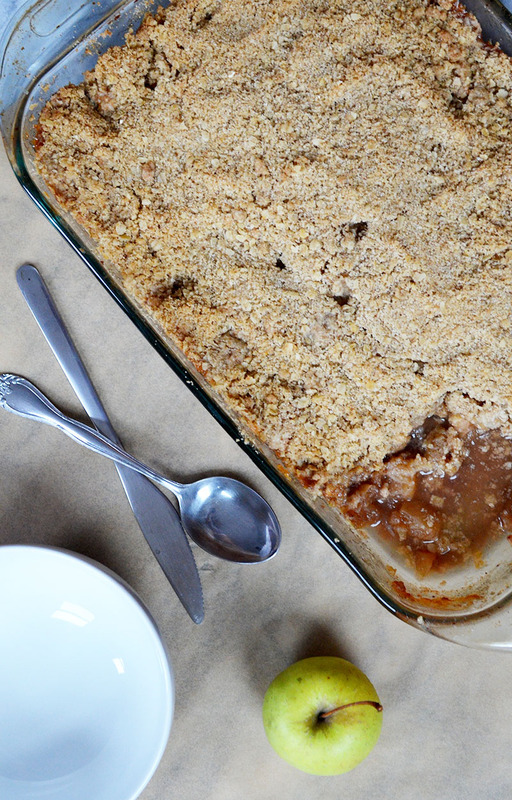 We love apple crisp around these parts and could probably polish off that entire pan in 15 mins! Pinned! Thank you so much Kristi! I am enjoying every bite! 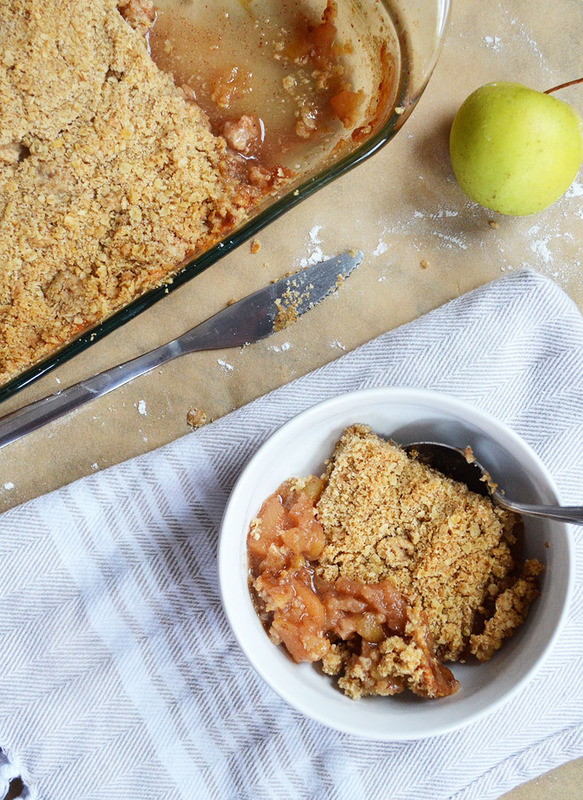 I’ve been dreaming of apple crisps, and this one looks amazing. Pinned! Thank you Rachel!! It is so delicious. Wish I could share it with you! Yum! This looks amazing. Also I can’t believe it’s already snowing in Boston!! Stay warm! I agree! Easier than pie and arguably, more delicious! (; I never want apple season to end! Love apple crisp, who am I kidding, I technically love anything that says “crisp” lol. This looks delicious! Thank you Catalina! I am sooo with you. Anything with crisp is a winner to me! Apple crisp are the best and this looks so perfect, especially for fall. Gorgeous pictures too! Thank you Danielle! It really was the perfect fall dessert!! I love a good apple crisp! Sadly, I have never made one. But it`s fall, right! This needs to change!